Finland has captured gold in Vancouver with a 3-2 win over Team USA in the final game of the World Junior Championship. With the score tied 2-2 late in the game, it was one of the top 2019 NHL draft prospects, Kaapo Kakko, playing hero for Finland. 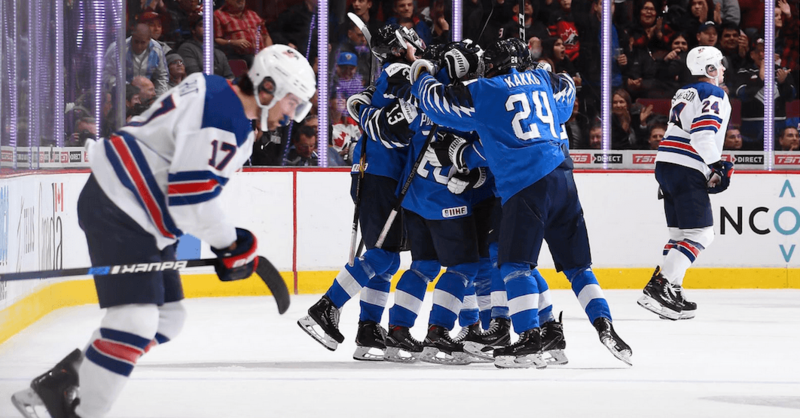 Finland was able to survive the USA’s pushback in the final minutes to claim their third gold medal in the last six tournaments, also winning in 2014 and 2016. It was a fantastic back and forth game, but it didn’t come without controversy. Team USA appeared to open the scoring midway through the first on a power play, but it was called back due to a crease violation by Alexander Chmelevski. It was a questionable call, with many people, including TSN’s Bob McKenzie and Craig Button, thinking the goal should have counted. That kept the game scoreless until midway through the second period when Jesse Ylonen opened the scoring for Finland on the power play. Heading into Saturday’s gold medal game it was USA’s power play that was by far the more deadly of the two teams, clicking at 31.8% compared to 18.2% for Finland, the fourth worst rate in the tournament. But it was the Finns with the special teams edge in this game. They killed off five USA power plays in the first 40 minutes, and converted on one of their three opportunities to hold a 1-0 lead after two periods. Finland picked up an early third period goal to go up 2-0 on another shot from the point, this time by Otto Latvala. Team USA would respond quickly with a great shift that ended in Chmelevski putting the puck past a sprawling Ukko-Pekka Luukkonen. 🇺🇸 responds with a goal of their own on the stick of Alexander Chmelevski, we're back to a one-goal game! Down 2-1, USA kept pressing for more. They had several close calls before Josh Norris scored to tie things up at two. The tie lasted through to the final minutes, where Kakko would score the golden goal for Finland. Both goalies were exceptional in the game, but it was Luukkonen winning the eventual goalie battle, and being awarded player of the game for Finland as a result. USA has now won a gold, silver, and bronze in their last three tournaments, while Finland takes it all this year after a disappointing quarterfinal loss at last year’s World Juniors.